French Polynesia exercises a powerful attraction. The islands, which cover an area about the size of Western Europe, have plenty of appeal despite their geographic isolation. 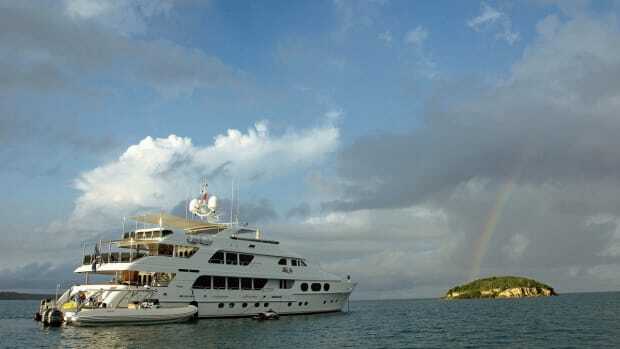 Of late, they seem to attract more private and charter yachts, many based in the Society Islands. On the long flight from LA to Papeete, the man next to me nervously drums his fingers on the hardbound book on his lap. We make small talk. A hour goes by, and soon he sleeps peacefully while rest continues to elude me. Our distant destination is still hours away, and the anticipation is keeping me wide awake. Finally we land at Papeete Faa’a International Airport, one of many daily flights (private or commercial) to reach this major gateway to French Polynesia. The InterContinental Tahiti Resort, only a couple of miles from the airport, is a welcome sight. Located on a private beach, it offers me my first glimpse of Moorea across the lagoon. Breakfast helps revive me and I am eager to explore the island with a small group of journalists who, like me, have been invited here by Tahiti’s tourism office. Our guide, Eric Vaxelaire, greets us in the lobby. His official title is director of the Monoi Institute and he’ll give us our first taste of Tahiti, introducing us to a few of the island’s residents. From them, we get a real education on Monoi, a fragrant oil made from the native tiare flower and refined coconut oil the islanders have used for centuries for everything from hair treatment to relieving sun burns. It is one of French Polynesia’s few exports. The production of homegrown products for the international market is another feather in the regional economy’s cap. But for years, French Polynesia has cultivated luxury tourism. As a result, it has much to offer educated travelers. On Tahiti, and elsewhere, fine dining blends Polynesian flavors with French influences. Le Coco’s, our next stop, is a staple of Tahiti’s gourmet cuisine and is often voted one of the island’s most romantic spots. Chef Willy’s light and flavorful dishes and Bénédicte’s creative desserts, imprinted with French tradition, hold their own against great views of Moorea across the lagoon. The restaurant’s seasonal dishes are a good alternative to the chef-prepared meals served on exclusive yachts, which cruise the region in greater number than ever. The country’s government and businesses have taken notice and have taken steps to continue to grow yachting by developing world-class yacht support and refit services. It is a long haul from the Panama Canal, more than 4,000 nautical miles, but this makes Papeete a choice location for a stopover after a major ocean crossing. The port of Papeete recently added a 300-ton marine travelift to haul out yachts and new pontoons for stern-to docking with dockside water and electricity service, plus 24-hour security. The Papeete Port Authority oversees Marina Taina, a facility on Tahiti harbor’s west side, which has two new docks available for visiting yachts plus mooring spaces with amazing views of the famous Tahitian sunsets. 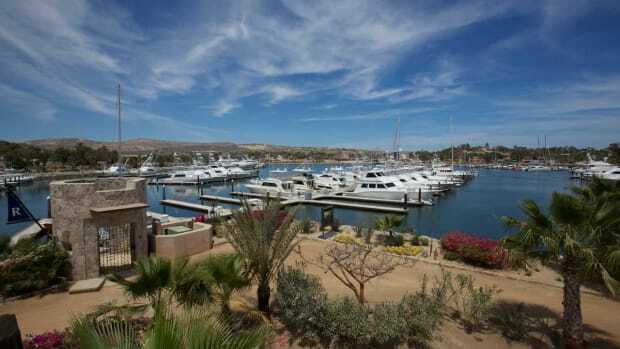 Many visiting yachts favor moorings outside of shallow lagoons. After all, French Polynesia consists of some 118 islands, including 78 atolls (remains of ancient volcanic islands), so there is no shortage of mooring options even around the populous Society Islands. This island grouping (one of five archipelagos) includes Tahiti, Moorea and Bora Bora, our next destination. It is a quick flight from Papeete to Bora Bora. Jumbo jets land on a small airstrip stretching along the water. 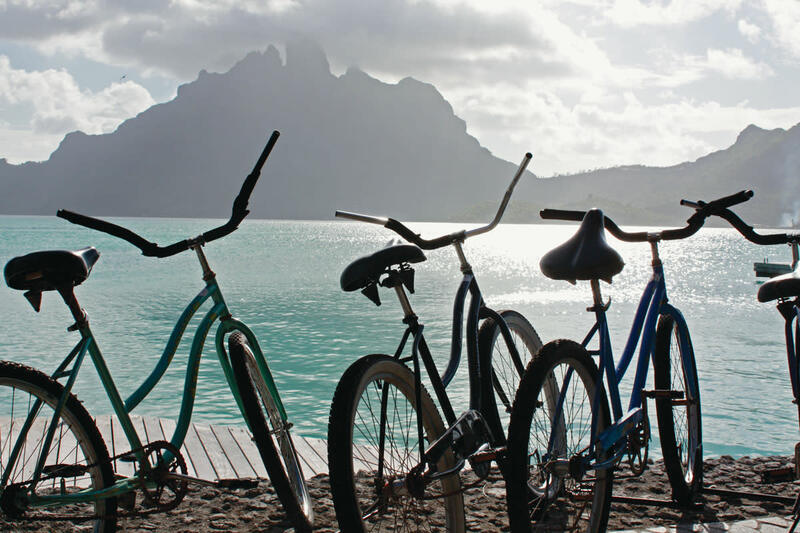 We take a water taxi to the St. Regis Bora Bora Resort, a quick ride that affords a first glimpse of Mount Otemanu. With its signature over-the-water villas and butler service, the St. Regis is a true water wonderland with its private saltwater lagoon. An open-water swim, however, is more rewarding for those craving a little adventure. Bora Bora’s healthy reef is chock-full of colorful fish, pink urchins, friendly stingrays and timid black-tipped and lemon sharks. Our action-packed day on laid-back Bora Bora includes a picnic on a motu, a typical Polynesian experience. Volcanic eruptions have caused islands to sink creating shallow lagoons and exposing coral reefs to erosion. The locals calls the small coral islets that were left behind “motu”. We end the day with the requisite Polynesian dance show, complete with rhythmic drumbeats. As they recede into memory, I drift to sleep to the sound of chirping geckos. We have to leave Bora Bora behind after just 24 hours. 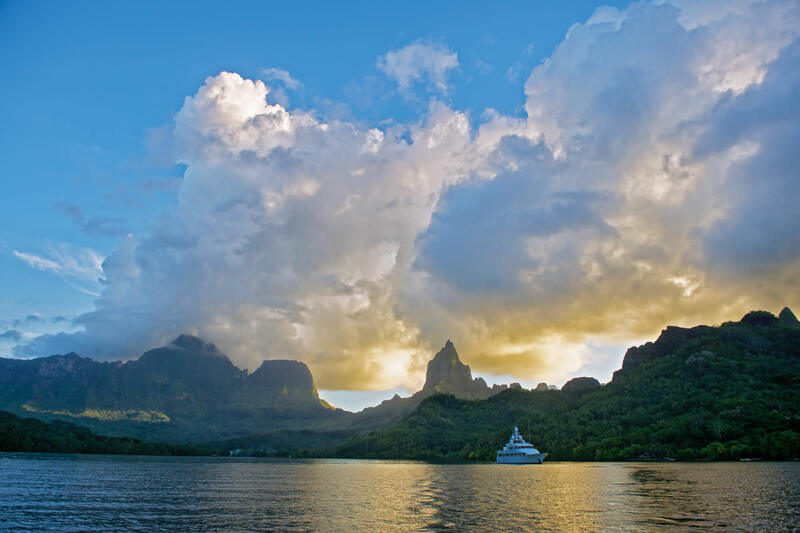 Moorea and Haumana, a Polynesian-flagged charter yacht and our home for the next three nights, await our arrival. 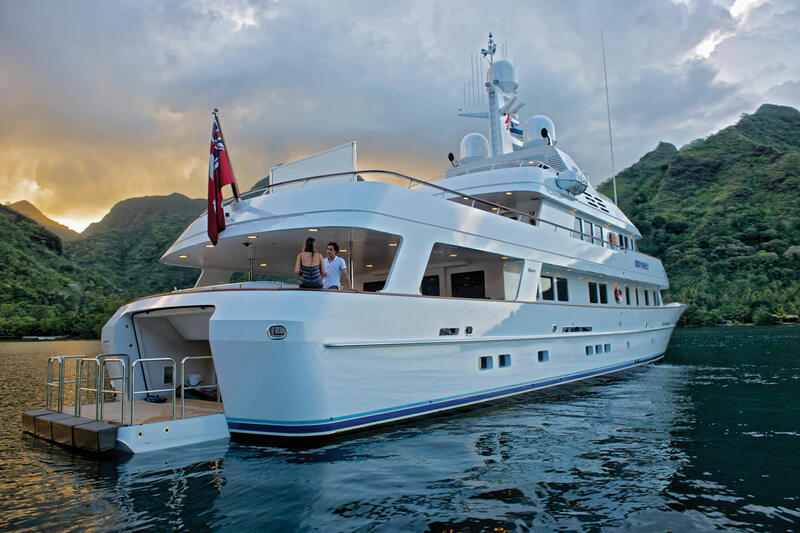 While many luxury yachts are now opting to spend a few seasons in the Pacific, this beamy motoryacht with 10 recently refurbished cabins is a permanent fixture in the Society Islands, so her 12 crewmembers are well versed in the destination. 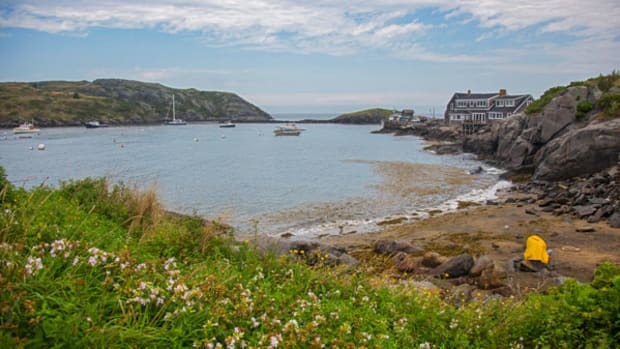 Our new home has a spectacular location, anchored in Opunohu Bay, where Captain James Cook moored his ships in 1769. We have lunch on board, a true Polynesian experience of fine cuisine with the Jurassic-looking backdrop of forested craggy peaks filling the scenery. You’d almost expect T-Rex to pop out of the canopy. Nature is never far in French Polynesia. 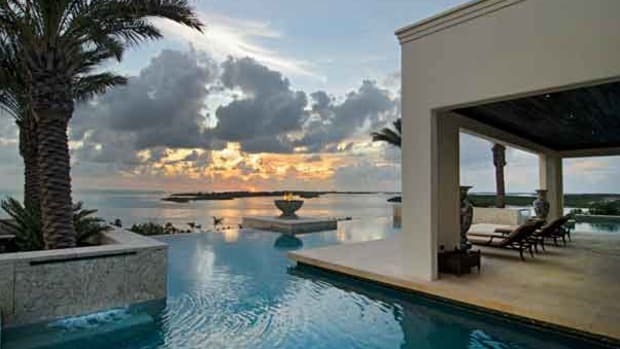 The cerulean depths harbor all kinds of natural treasures, including five species of sea turtles. Te Mana O Te Moana (or “Spirit of the Ocean”), a turtle rehabilitation and educational center, teaches Polynesian children to preserve the gentle giants for future generations. Education and familiarization are also the goals of the nearby Moorea Dolphin Center, home to three playful bottlenose dolphins. It is not a typical swim-with-the-dolphins tourist attraction, as we soon find out. A trainer shows us how to interact with these amazing mammals in a natural lagoon environment. The sea is intimately tied to the Polynesian culture, and it has provided for the island inhabitants in many ways. The iridescent pearls that adorn the necklines of beautiful women around the world, for instance, are one of French Polynesia’s precious resources. Families have learned to duplicate the natural process that creates the stunning Tahitian black pearl. Pearl farming is now a half-century-old tradition. A shell bead taken from a Mississippi River clam—not a grain of sand—inserted into an oyster starts a process that will take anywhere from 18 months to two years. Farmers have to wait this long before finding out if their harvest will yield a quality pearl (only two percent of the cultured pearls meet the necessary criteria: luster, size, shape, surface quality and color). Other treasures from the sea include humpback whales that congregate there a few months a year from August to November and, of course, dolphin, shark and manta rays. Snorkeling or diving is a must-do in Moorea and beyond. Private and charter yachts dropping anchor anywhere in French Polynesia do so in part attracted by the abundant marine life and colorful reefs. 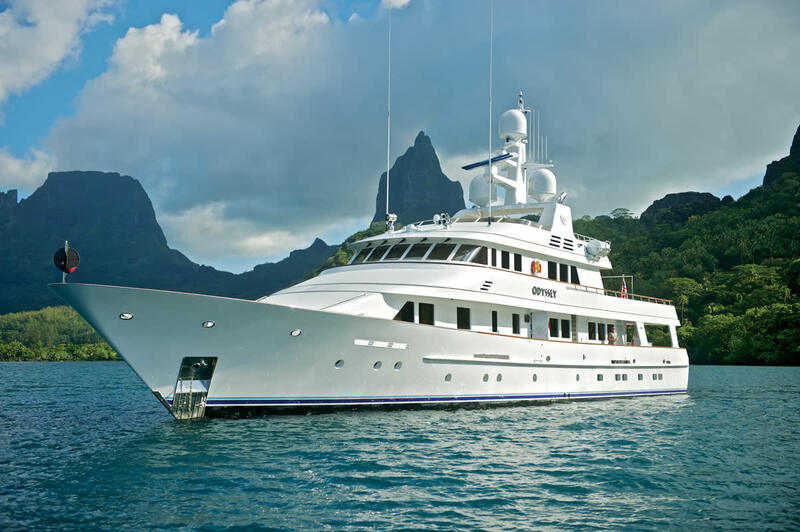 While landside, companies such as Tahiti Yacht Services and Tahiti Ocean take care of such things as clearances, authorizations, dockage, cruise planning and even parts replacement. 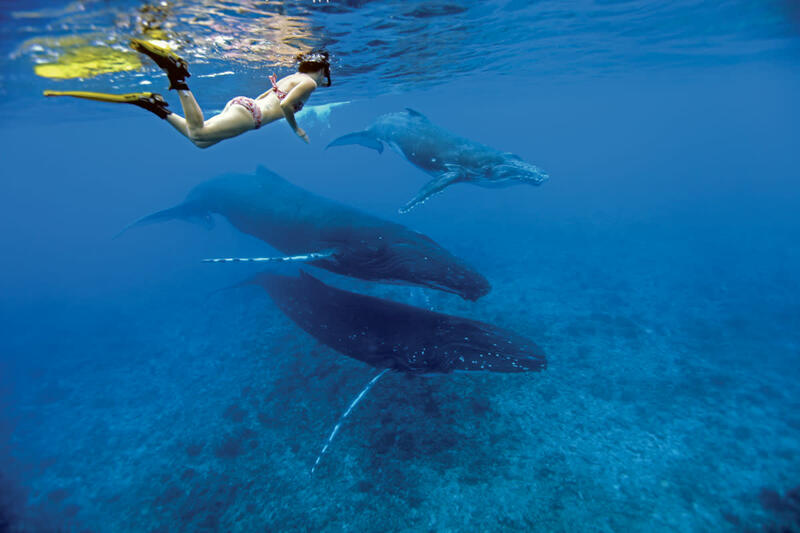 Rodolphe Holler launched Tahiti Private Expeditions in 2006 to help visitors discover the islands’ underwater world. He has created tailor-made diving expeditions for guests aboard countless yachts, including Maltese Falcon, Octopus and SuRi. Holler specializes in “rebreather diving” to minimize the release of bubbles, bothersome to dolphins and whales. A true marine mammal enthusiast, he is a knowledgeable guide with an eye for photography. French Polynesia, indeed, provides great photo ops below and above water. Back on Tahiti—which, in reality, is comprised of the two islands of Tahiti Nui (big) and Tahiti Iti (little)—a leisurely drive turns up great images, sounds and smells. A melodious mix of French and Polynesian drifts out of the doors of a stone church, “A faaroo mai, i te Evaneria E, Parau ora, e parau mo’a, Aleluia, alleluia.” Parishioners, men and women alike, dressed in brightly flowered wraps have adorned themselves with nature’s jewelry, Tahitian pearls and freshly picked tiare flowers. Around a bend a sign points the way to Mara’a Grotto, where cool, clear water offers a perfect bath for tired feet. From a black-sand beach where a family enjoys a Sunday outing drifts the sound of ukulele and laughter. On the Taravao Plateau, where ancient people blew into conch shells, cows graze and gaze at the idyllic view. Locals offer directions willingly, arguing before posing for pictures. The aroma of stuffed crepes served on colorful tablecloths drifts in the air and proves impossible to resist. There is so much to French Polynesia where simplicity meets luxury, and natural meets exotic. Just think about it all during the flight and enjoy the anticipation. 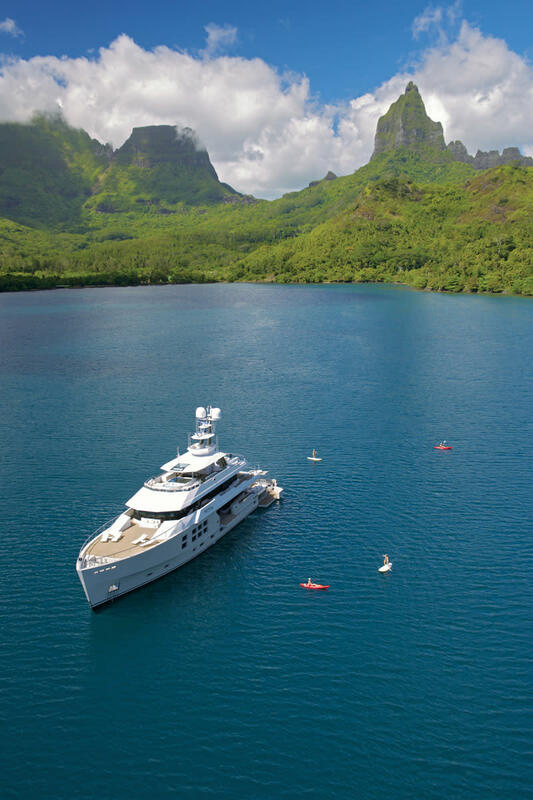 The yacht Odyssey is a recent addition to an increasing fleet of charter yachts that call French Polynesia home. Short jaunts along populated coastlines or anchoring off popular Mediterranean ports were not in the cards for this oceangoing vessel. Odyssey, a classic steel-hulled vessel, arrived in French Polynesia last fall and will be there for the next few years. 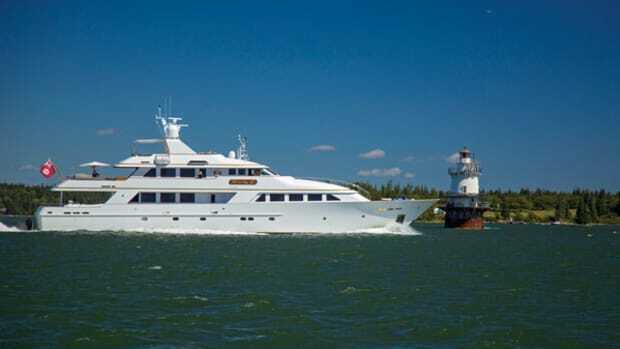 She underwent an extensive refit at Feadship’s De Vries shipyard. After a few months in Florida and the Bahamas in 2011, she cast off for the Pacific. Odyssey, launched as White Rabbit, proved her seaworthiness during her maiden voyage from the Netherlands to Singapore. She did four circumnavigations before her new owners came along. 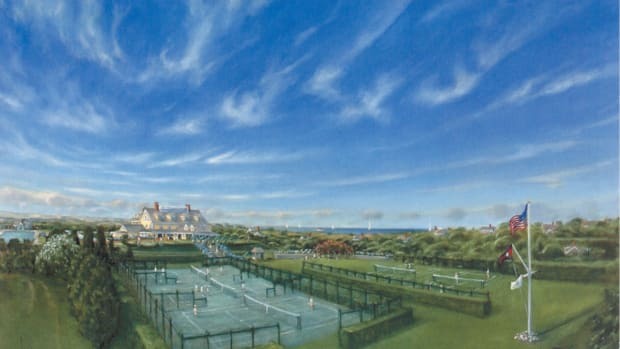 This proven yacht had nearly everything they wanted, except for a beach club. This became the starting point for a 10-foot hull extension. De Voogt Naval Architects also extended the bridge deck and sun deck to achieve a pleasing profile and provide the additional exterior and interior space the owners wanted. Sporting new paint by DuPont, the yacht shows no signs of the refit. Her lines are harmonious and the extension improved the yacht’s stability, even before the shipyard installed large Quantum fin stabilizers. 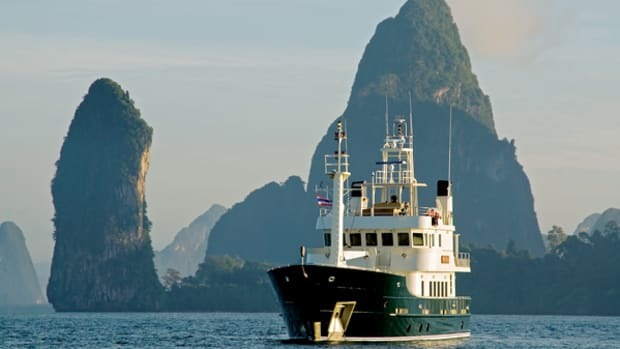 She also features a renewed interior, new bathrooms, new machinery (except for the Caterpillar mains, which were rebuilt in 2005), new insulation, a brand-new galley, new pilothouse, a new Jacuzzi and a bigger swim platform with stern door and lazarette, perfect for staging the dive gear Odyssey carries. The crew consulted Fort Lauderdale Diver when planning the dive locker, which includes 12 new diving sets and a Nitrox compressor. 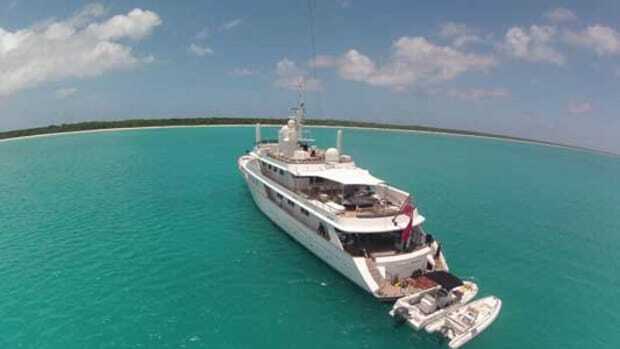 The crew includes dive masters, and the yacht has an underwater HD video camera to record wonderful keepsakes of deep-sea adventures. On the main deck, new U-shaped seating is perfect for a pre-dinner cocktail or even a simple lunch. A formal table can be set for up to 14 guests. On the bridge-deck level, the expanded skylounge has room aft for a 22-foot Novurania tender and davit. The space converts quickly into an attractive outdoor salon and lounging area. In addition to T.T. Odyssey, the fleet includes a 34-foot McMullen & Wing tender named Iliad. The mothership is a full-displacement vessel with a 10-foot draft and a 12-knot cruising speed, so her speedy tender is a great way to extend the range. Outfitted with outriggers and an open plan, this stylish center console is suitable for diving, fishing or cruising to shore. The yacht sports a new radar dome, designed not only to harbor all the new electronics and communication systems suited for long-range cruising, but oriented precisely to maximize sun exposure on the appropriately named sun deck. 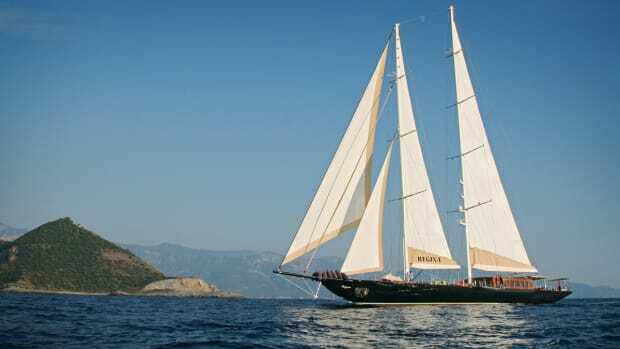 For shade, the yacht carries an elegant custom-made three-tiered set of sails, mounted on rods. Odyssey’s guests also have the option to cool off inside. Custom shades and screens can filter the light or block it out altogether, for restful slumber. To renew the interior, the owners turned to design firm Redman Whiteley Dixon, which made great use of the yacht’s excellent bone structure during the facelift. The designers complemented the beautiful existing teak with a few fabric wallboards, added for contrast in the main salon/dining area. The expanded skylounge is a relaxing retreat with pleasant shades of blues and whites and a new teak-and-holly flooring contrasting with the whitewashed oak walls. The bridge deck also is the entertainment deck. A large screen can be set up outdoors for movie night under the stars, in addition to the 60-inch-wide TV screen in the skylounge. Movies are available in the guest staterooms through a Kaleidescape server. Personal music libraries can be brought along, as the yacht is ready for iPods, and the day’s activities and menus are available on Odyssey’s iPads, linked to the ship’s Crestron system. To complement outdoor dining, the yacht features a stunning custom-made table created by Silverlining in the United Kingdom, which matches the game table in the salon. It’s a great setting for an elegant meal. During the refit, the yacht was fitted with additional refrigeration and dry storage to ensure the chef never runs out of essential ingredients no matter where Odyssey cruises. The refit also made room for a EuroCave refrigerator with dual humidity controls to transport fine wine. You can’t take any chances, even in French Polynesia.